Mr. Baker Bowl himself, Chuck Klein. Probably no player’s career was as affected by the Baker Bowl as Klein’s was. 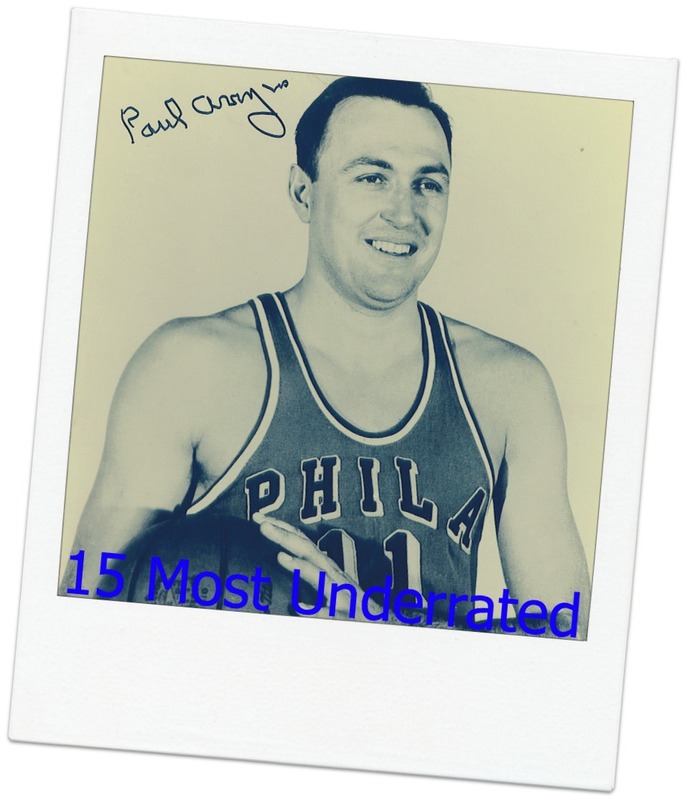 He was a lefthanded batter who learned to hit high flyballs into right field, and batted an incredible .395 in 581 career games at the Baker Bowl (He hit .286 in road games and .221 after the Phillies moved to Shibe). 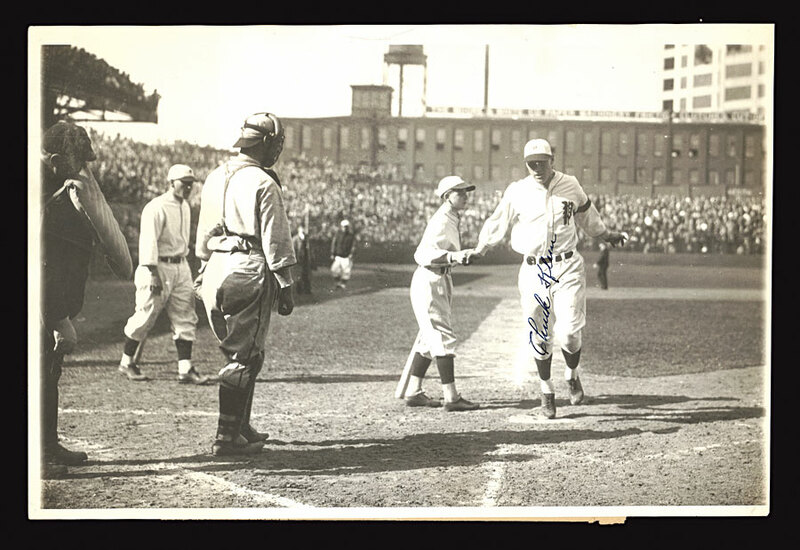 He also hit 164 homers there, as opposed to the 136 he hit in the over 1200 games he played in stadiums other than the Baker Bowl. 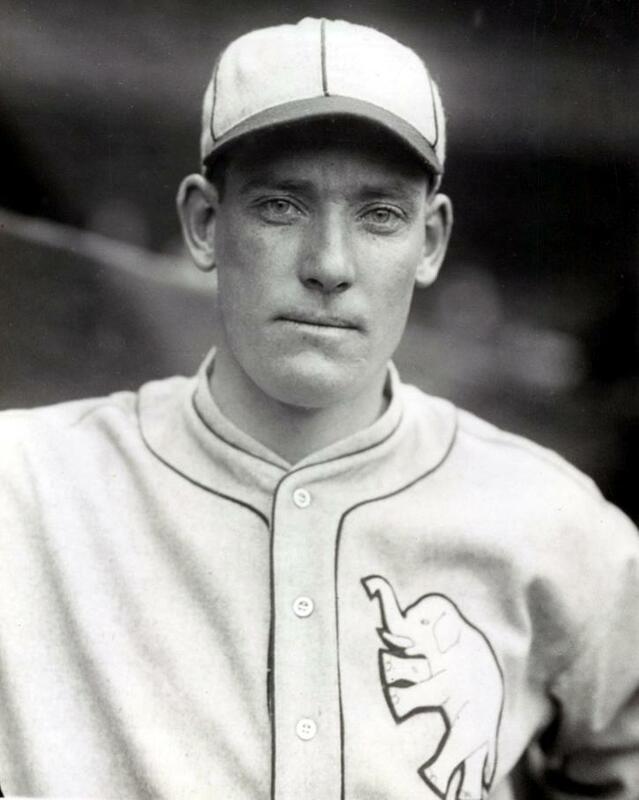 In 1933, his splits were laughably absurd, as he hit .467 with 20 HRs and 81 RBIs in 72 games at home, and .280 with 9 homers and 39 RBIs in 80 games on the road. This home cooking kept Klein out of the Hall until 1980. 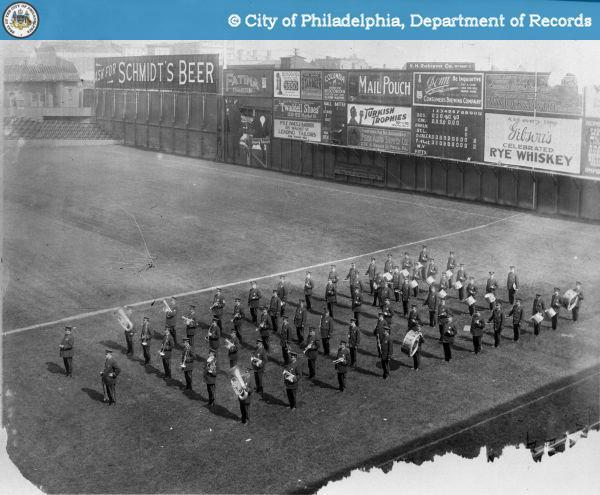 This shot must have been taken in the 1900s or 1910s, because there is a beer sign (before Prohibition) and the fence is moved in tight at center (there would later be a gap between those center field seats and the fence, which provided sort of a strange nook you can see below). Notice how center field stands seem to extend into the field. 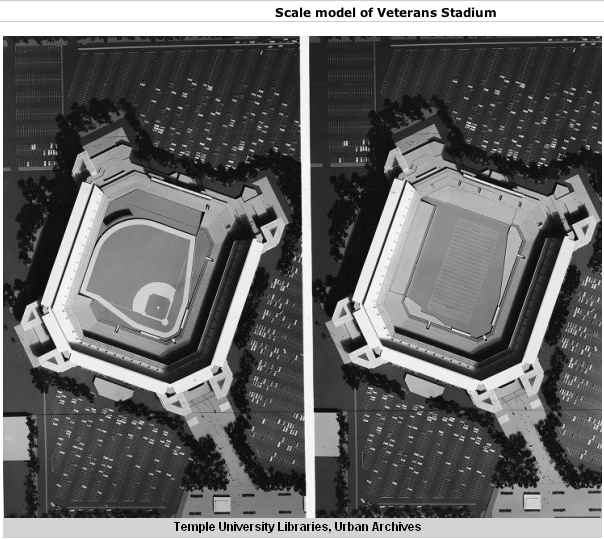 You can also see it in centerfield of this pic of Baker Bowl dimensions. I also don’t see the Lifebuoy sign or the tin fence above. 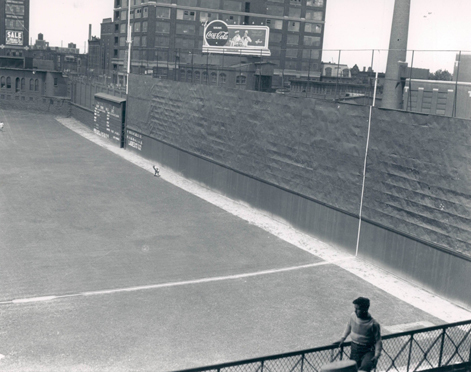 I do know they moved the rightfield wall back about 8 feet in the 1920s. I’m thinking that that created the strange nook in center, and is why you don’t see it in the above photo. 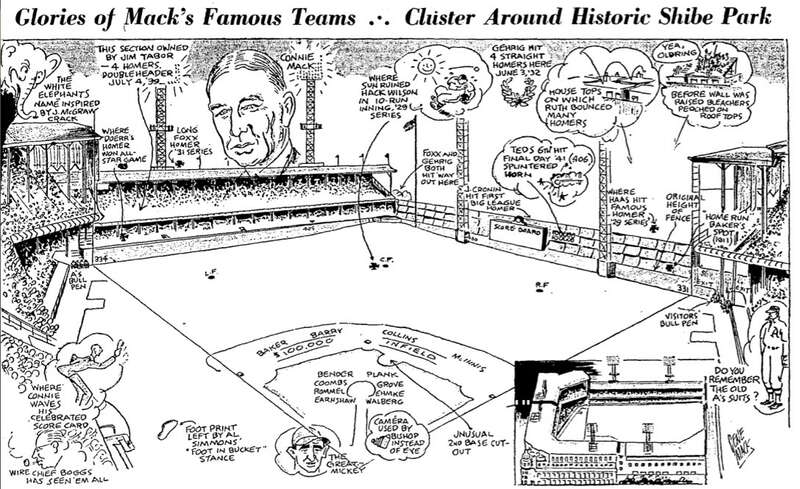 As for the giant tin wall in right, that was an added creation once they realized how absurdly easy it was to hit a home run there. 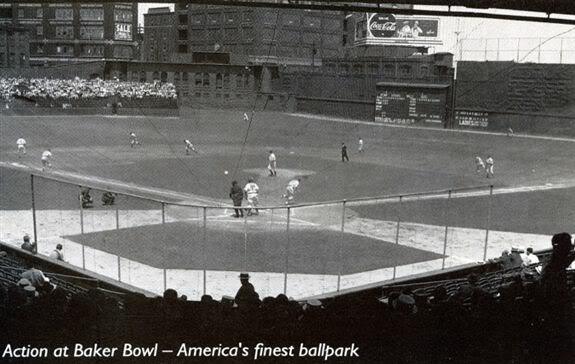 This is just a great shot of the whole venue (sent to us by site fan Mark Komp), though whoever wrote “America’s finest ballpark” was clearly delusional or had never been to another ballpark. Must have been so weird to play center. You could run due right chasing a fly ball and crash into a fence. 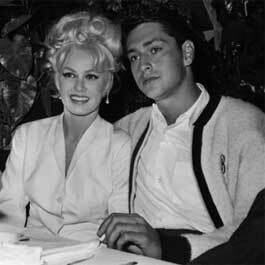 I believe this shot was from the 1930s. I know that Coke sign was still standing after the ballpark was no longer in use. This shot gives you a good idea of just how tall that crazy right field wall was. 60 feet, 23 feet taller than the Green Monster. CHeck out how it looms over the guy in right field. It was constructed of a bunch of different materials, then covered with tin, so it made a very distinctive sound when the ball hit it. ANd keep in mind, the mesh fence above the green was also part of the field. 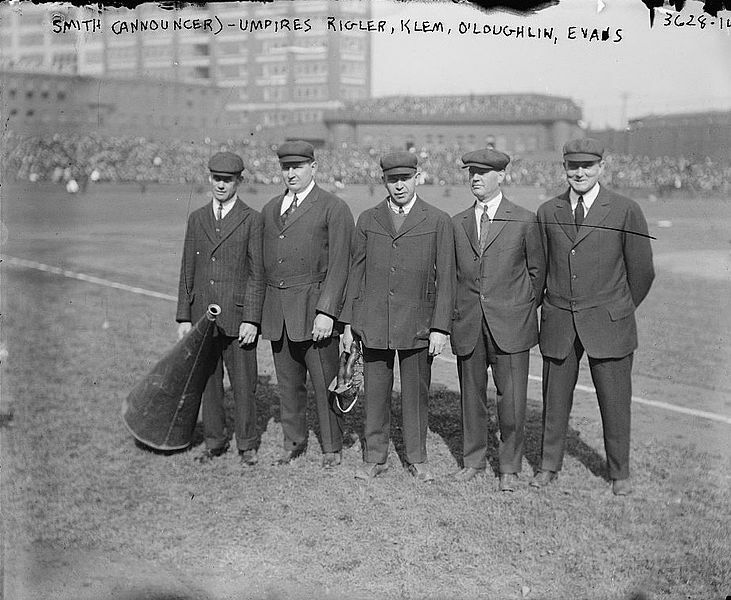 Here are the umps for the 1915 World Series at the Baker Bowl. 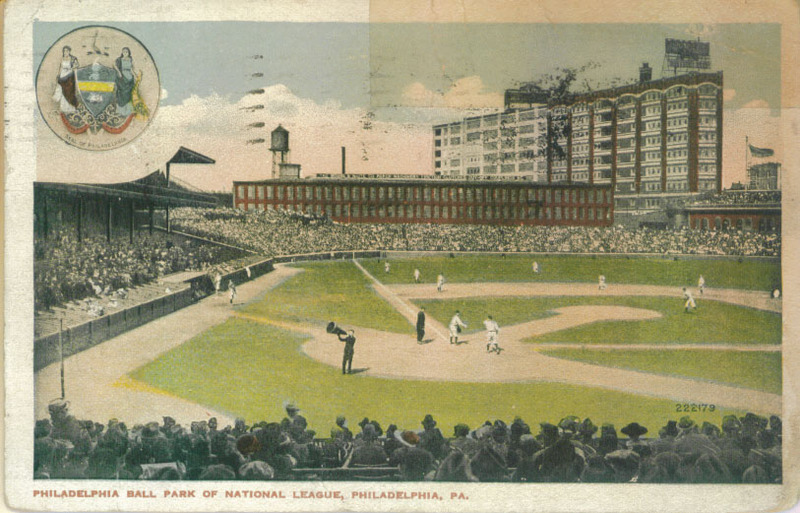 The guy with the megaphone is the PA announcer, and I wonder if he is the same guy you see in this postcard, since it was a similar time period. Now if you haven’t seen it already, this computerized model of Baker Bowl is well worth a gander. Here’s Part 1 of the Baker Bowl photos.